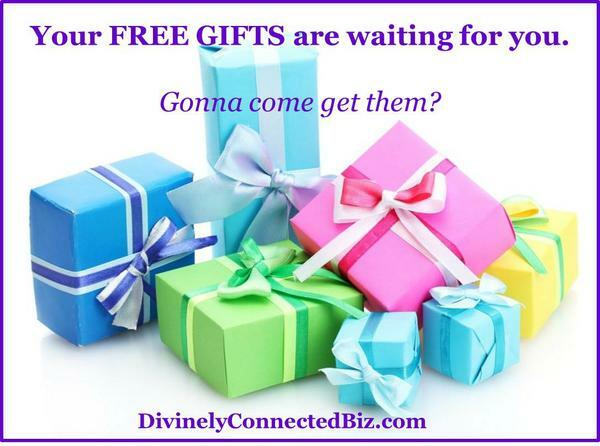 [MMIT We All Have Divine Gifts – What are Yours? There always seems to be one question that continues to elude even the smartest, most faithful people- What is my purpose in life? The truth is that deep down, you do know, but the answer you've been seeking has been covered up; by adult obligations. By "shoulds." By the weight of responsibility which deceived you into thinking you couldn't have it all. Has the chaos and "noise" of day-to-day living caused you to lose sight of your life's purpose? Do you sometimes feel like you are running out of time to figure it all out? 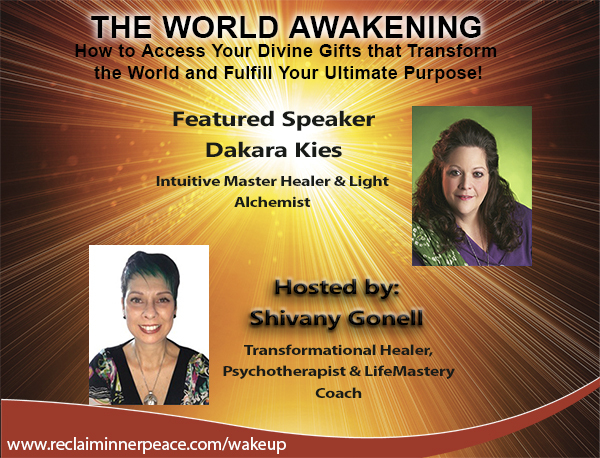 I'm here to tell you, Dakara, that your unique gifts are within you, waiting to align with your reality in order to help you achieve your dreams. You just need to know how to uncover them. And the good news is, that knowledge is now within your reach. All you need to do is make time to listen to people who have been where you are and who have gone on to live the blessing of that kind of clarity! My friend and colleague, Shivany Gonell, is hosting an amazing master class series beginning on October 31, 2016. It's called The World Awakening and as part of my community it is 100% F*R*E*E* to you. It's going to show you exactly how to unlock your divine gifts, find joy, and transform not only yourself, but the world around you. Shivany has gathered 26 leading experts (myself included) and we are each going to reveal our journeys to clarity, joy and fulfillment and give YOU our best advice for doing the same. Maybe you're thinking that you've heard it all before. But Shivany's event will prove otherwise. Healing Energy and Vibrations that you can learn and do on yourself! Uncovering your divine gifts and figuring out how to put them forth into the world can be challenging when you are trying to go it alone. So don't! Click here to get your FREE access link to the master class. Listen to the speakers. Make this the year that everything finally gets clear for you! Our panel of experts will walk you step by step through this journey of self- discovery. No matter where you're coming from, or what you've tried before, a life of meaning and true joy can be yours. We will show you how. I am so thrilled to be a part of this program. I truly hope you will make the decision to begin banishing those feelings of doubt and regret and instead, welcome a new reality that is DESTINED to be yours. Click here now to join in. You'll receive immediate access to 26 life-changing interviews AND bonus offers, too. P.S. I am sure you are thinking about the long to-do list and the packed calendar and wondering if you'd even have time to listen. This master class series is recorded. You can listen whenever you want! Download the free gift and read/watch then WHENEVER you want! It's worth it <Dakara> YOUR happiness is worth it! [MMIT Divine Gift GIVEAWAY! Only 2 days left! Only two days left for the most amazing GIVEAWAY ever! This is just a quick reminder just in case you've not had a chance to get your goodies in this massive giveaway! P.S. - I'm sure you must be asking yourself "What's the catch?" There's NONE. You simply enter your name and email, and you will be given instant access to TONS of goodies at no cost whatsoever. My friends, Rev. Anne Presuel & Sherry Bowers just released the internet's best joint venture giveaway ever, specifically geared toward spiritual entrepreneurs! You'll find 3 gifts and a special offer from me this time! Once you click on the link... scroll down and click YES! Then venture off to see all the other gifts available to you NOW!!! Any one of these gifts could take your life to the next level!!! Anne & Sherry have invited in a whole bunch of top-level spiritual entrepreneurs and convinced them to give you a whole BUNCH of fr*ee products and services at no cost to you. It is our way of saying "Thank You!"